Rewilding Agriculture, or Wildlife-Assisted Permaculture, is a fundamental stewardship philosophy at SHO Farm/Sanctuary at SHO. Most regenerative or wholistic farmers use livestock to cycle nutrients in their systems. We are deeply immersed in researching and developing how to partner with our resident wildlife to achieve the same nutrient cycling. 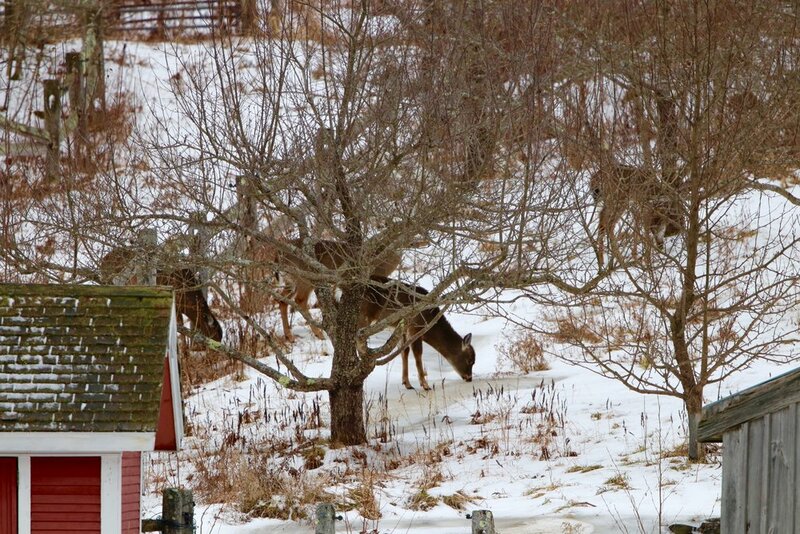 This winter we’ve been delighted by daily visits to the farmstead by a deer herd of 10. This photo captures 4 of them foraging in one of our apple orchards, taking advantage of the 42 degree temp, low/no snow cover, and easier access to high quality calories. In return they will leave an abundant supply of fresh, high quality fertilizer.